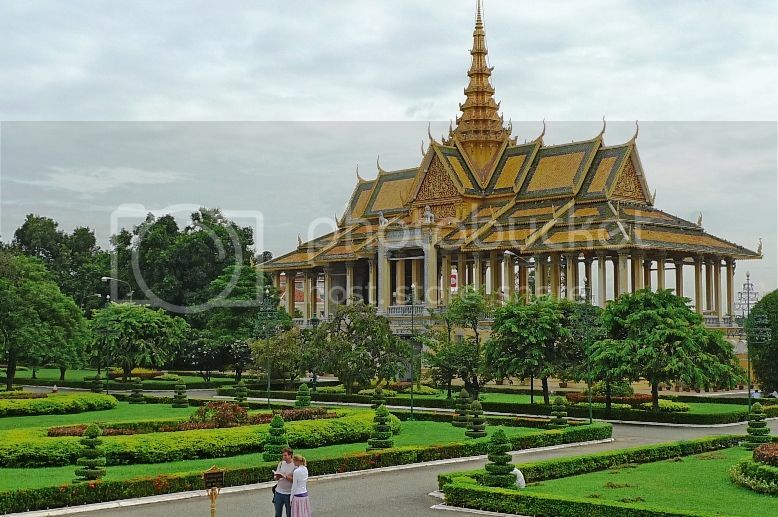 On our first morning in Phnom Penh, Jam, his friend and I visited the Royal Palace. A good friend in Cambodia who had paid for our 2 nights stay in Asia Hotel had arranged a tuk tuk driver to take us there. Although we had some phobia sitting in a tuk tuk after that accident in Siem Reap, we simply could not turn down our good friend's hospitality. Fortunately we arrived safely at the Royal Palace at about 9.15 am. We paid USD3 each for the entrance fee. This is the pathway leading to the entrance of the palace complex. 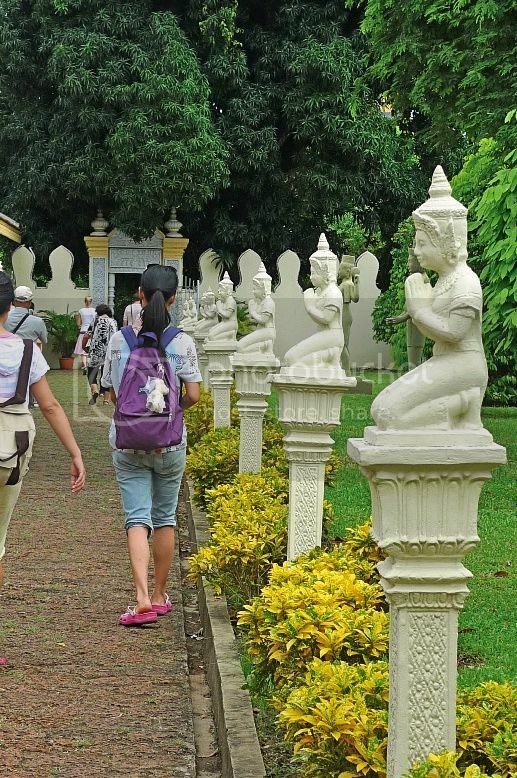 It is flanked by nicely carved Buddha statues on one side. 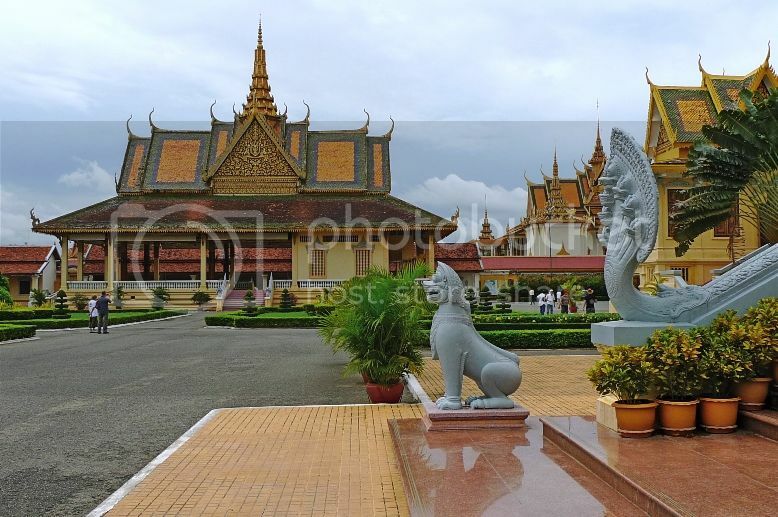 The Royal Palace is a complex of buildings which serves as the royal residence of the King of Cambodia. 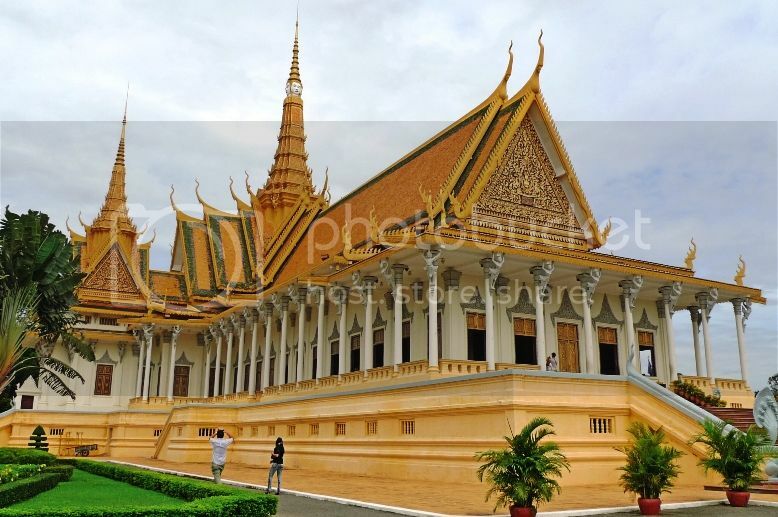 The palace was constructed after King Norodom relocated the royal capital from Oudong to Phnom Penh in the mid-19th century. 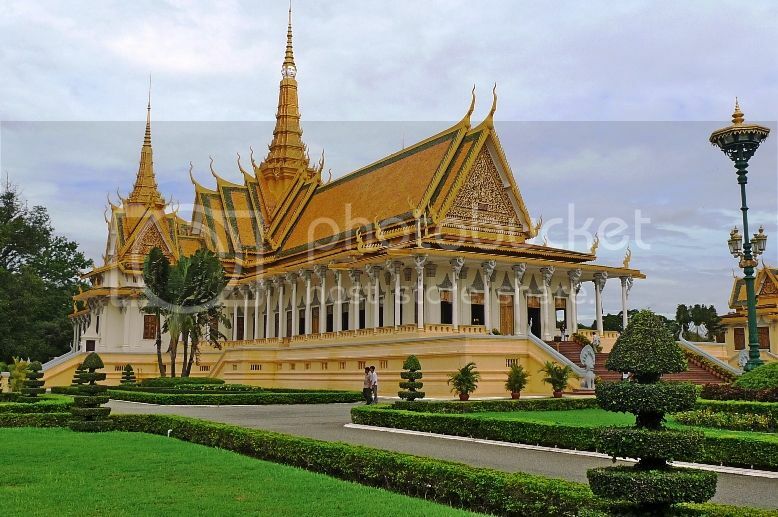 Covering a total area of 174,870 square meters, the Royal Palace faces east and is situated at the western bank of the cross division of the Tonle Sap River and Mekong River. The palace complex is divided by walls into 3 main compounds. On the north side is the Silver Pagoda, to the south side is the Khemarin Palace and the central compound contains the Throne Hall. We visited the Throne Hall first. 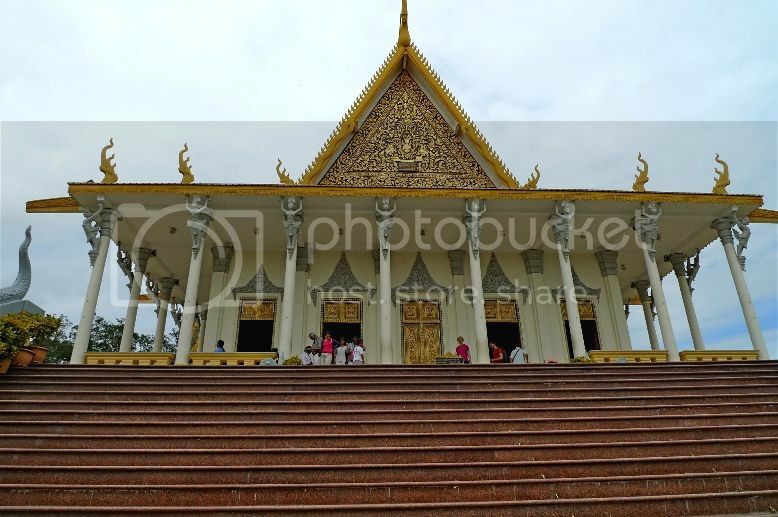 The Throne Hall (or Preah Thineang Dheva Vinnichay) was where the king's confidants, generals and royal officials once carried out their duties. 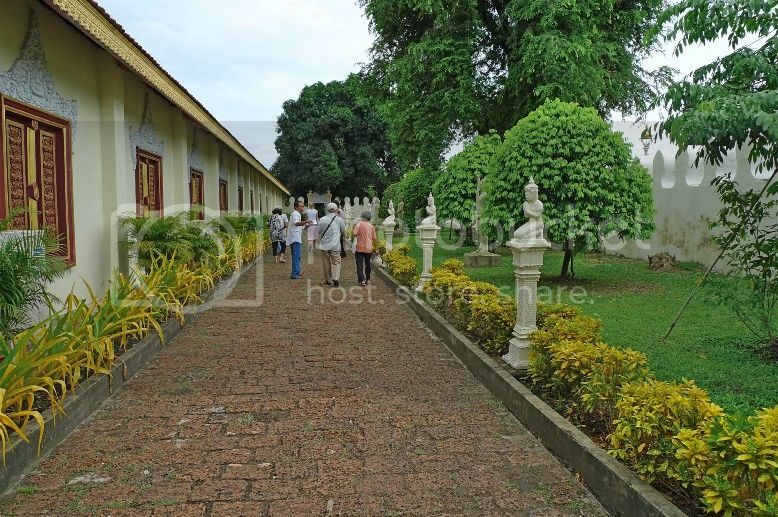 Today, it is used as a place for religious and royal ceremonies as well as a meeting place for guests of the King. The main staircase leading into the Throne Hall is flanked by naga railings on both sides. 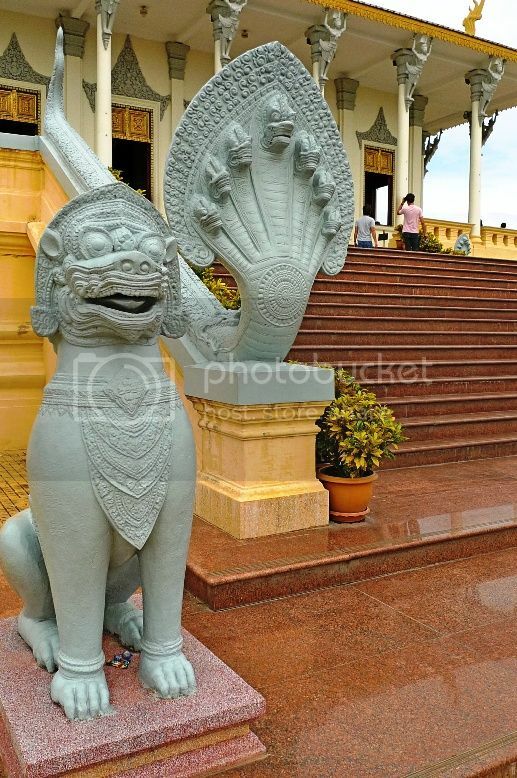 A close shot of the naga (7 headed serpent) and a "lion" statue guarding one side of the entrance. 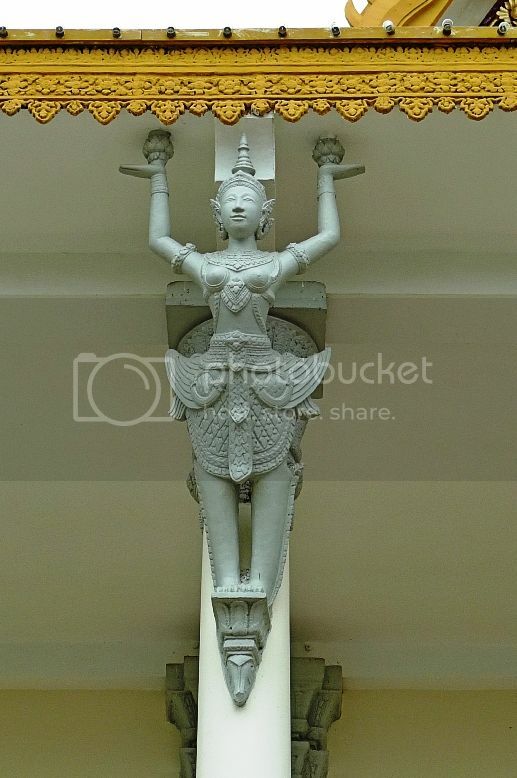 Walking up the stairs, we could see statues of Garudas and Apsaras on the ceilings and columns of the building. I thought the Garudas and Apsaras statues on the columns made the Throne Hall building look really special and magnificent! Photography was not allowed inside the Throne Hall so I have no pictures to show you. We had to take off our shoes and hats before entering the hall. 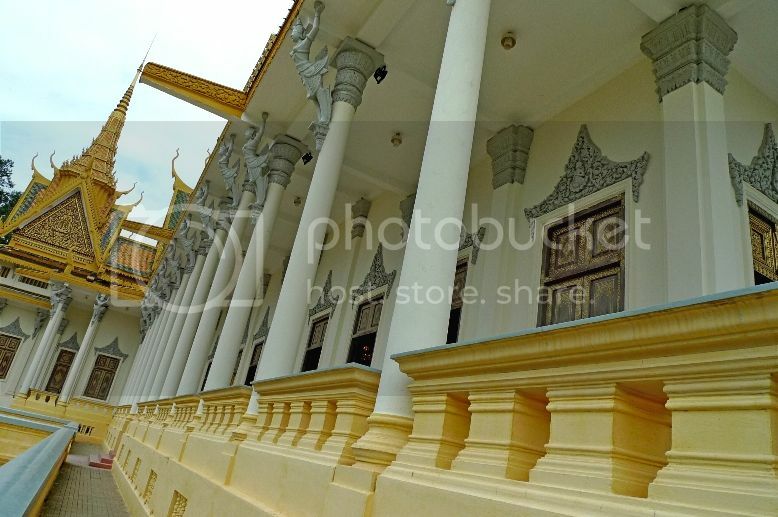 Coming out of the Throne Hall, I captured a photo of the long naga railing leading down the stairs. On the right side of Throne Hall from where I stood, there is another building called the Phochani Pavilion. 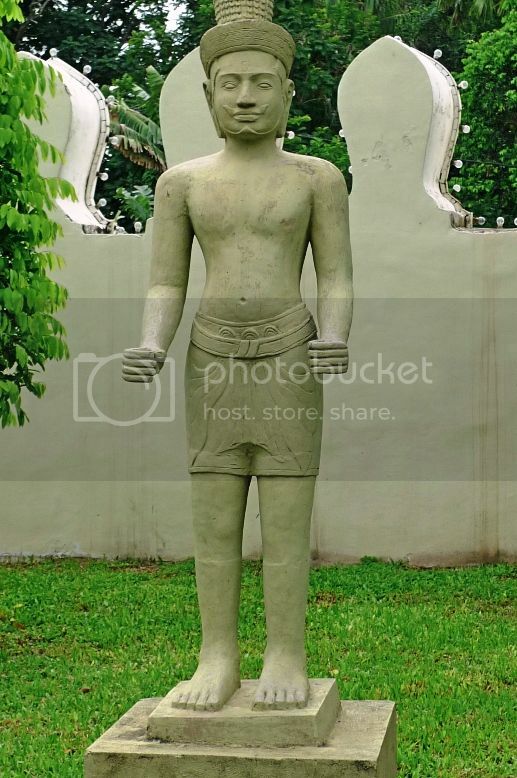 Phochani Pavilion was originally constructed as a classical dance theater. 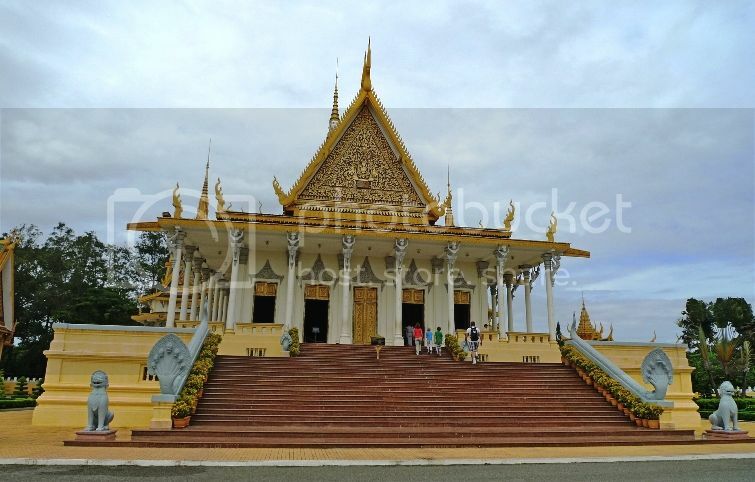 However, it is currently used for royal receptions and meetings and thus is closed to the public. Since we could not go in, I took a few more shots of this building. 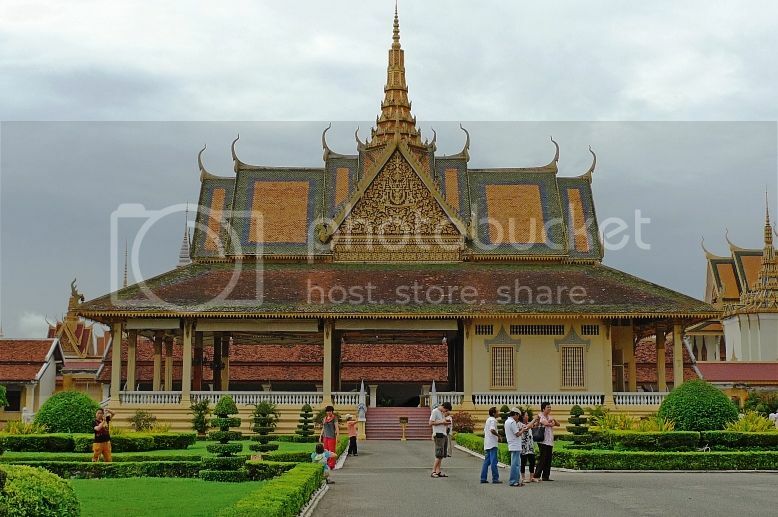 Next, we went into this building called Hor Samrith Phimean also known as the Bronze Palace. There were some royal regalias displayed in the Bronze Palace, like bronze bowls, lacquer plates and traditional costumes. 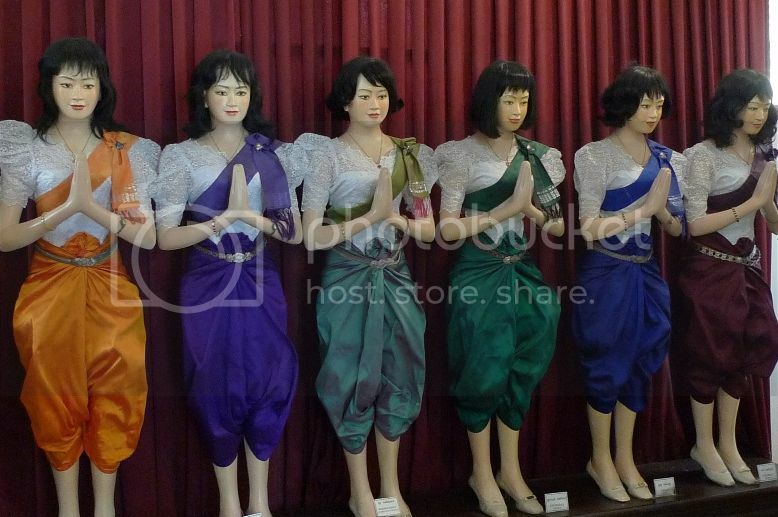 I did not take any pictures except for these traditional costumes for Khmer ladies. 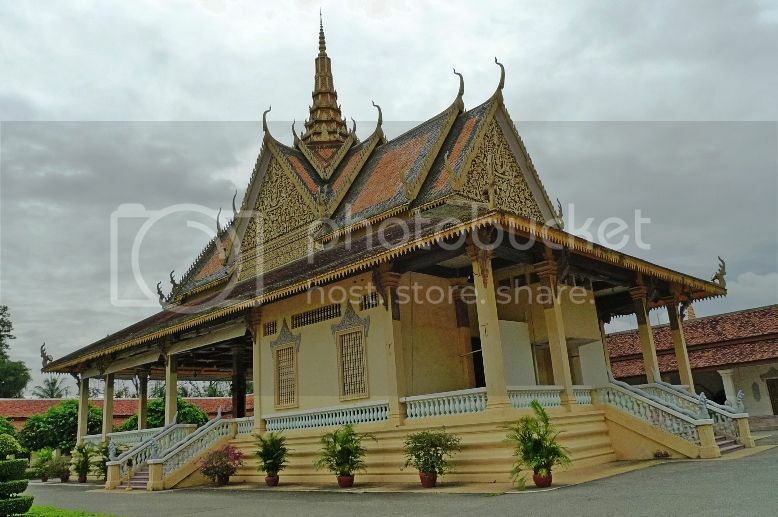 There is also another building near the Throne Hall called Moonlight Pavilion (or Preah Thineang Chan Chhaya). 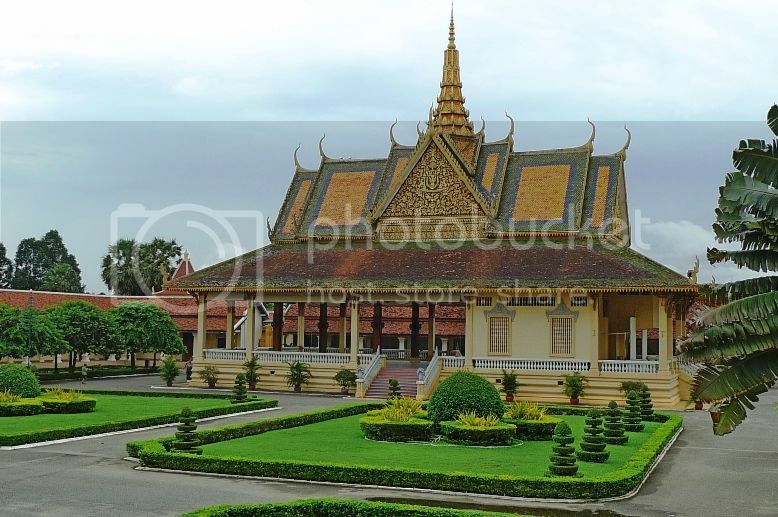 It is an open-air pavilion that serves as stage for Khmer classical dance. It is also one of the most notable buildings of the palace as it can be easily seen from the outside as it was built alongside a section of the palace walls. However, the Moonlight Pavilion was closed to the public that day and we did not get a chance to visit it. 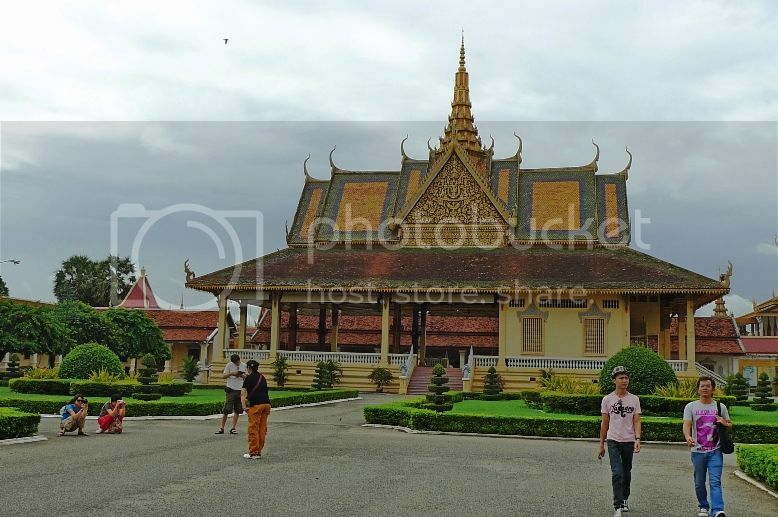 As mentioned earlier, the Royal Palace is divided into three compounds - Throne Hall, Khemarin Palace and Silver Pagoda. We were done with Throne Hall. 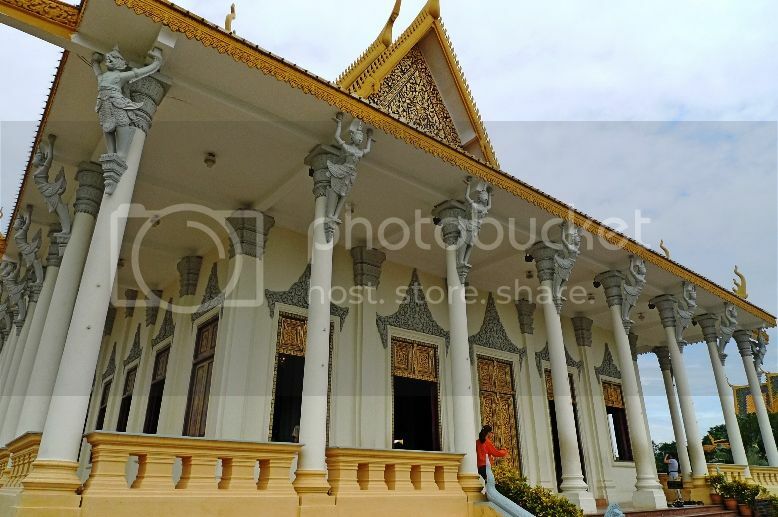 Since Khemarin Palace was off limits to visitors, we visited Silver Pagoda next.